I accidentally came across this drama and fell in love with it in an instant and waited impatiently for more episodes to come. The last ep is not out yet, but I wanted to express my thoughts regarding this amazing drama. This drama is based on a novel and portrays the things happening in a cardiovascular department. If you are a fan of heroes, you will love this drama as we have a super human doctor who can save any patient by his demonic surgery skills, which seems almost impossible in reality. So, if you expect more of a realistic medical drama, you may not like it, but however, except for the portrayal of a god like doctor who is impossible to exist , all the other things in this drama are realistic as they are happening in reality in the medical field of Japan. Also, I have to say that Nino's ad libs in this drama are awesome. If you are a fan of Nino, you will definitely love this drama and will fall in love with him again and again. His portrayal of Dr. Tokai is really awesome and I wouldn't have enjoyed the drama this crazily if another actor played Dr. Tokai's role. All the actors in this drama are awesome and even the doctor who gave advices for this drama have praised them in his medical commentaries for the drama. I really love the innocent Dr. Sera, bratty nurse Nekota, enigmatic medical coordinator Kinoshita and all the other characters who are either hilarious or annoying. I have watched all the episodes that have aired so far multiple times. I am drawn to arrogant and cool Tokai sensei who is great in using both scalpel and newest technology in operations and stops at nothing to save lives. The other thing I love is his smirk which really kills me every time he appears on screen. I am curious about the mystery going on in this drama which has also been able to add depth to it. One can really enjoy this drama except for the hospital politics going on. 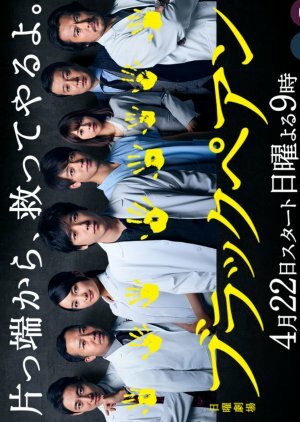 Black Pean is so dramatic, and also a bit mysterious as it will let you keep guessing on what will happen next, specially during the surgeries. I also have to say that this is not every one's cup of tea and more like a medical drama combined with mystery and a fantasy doctor. Well, that's my opinion. Highly recommend this drama for Nino's fans and also for those who love to enjoy watching operations and of course for those who enjoy dramas with a super hero. This is a drama that I really enjoy these days and hoping for a season 2. So, I would give 10/10 for this.